Section is minimal, light weight content focused portfolio WordPress theme with modern layout. Its 100% responsive layout adopts the screen size of whatever devices your visitors are using. Built using Twitter Bootstrap 3 framework, enabled with layered navigation menu and full width header image. 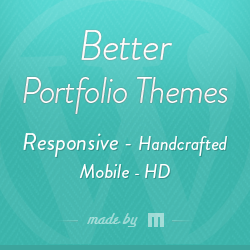 Section portfolio theme designed to work with any language by utilizing bundled .PO file. Section portfolio WordPress theme compatible with latest WordPress version 4.0 and its cross browser compatible, parallax enabled, search engine friendly structure coded with valid HTML5 / CSS3 code standards. Supports 600+ Google web fonts, 400+ font awesome icons included with powerful sidebar manager and handy custom widgets as well.